Colour contrast - why does it matter? Colour contrast between text and background is important on web pages. It affects some people’s ability to perceive the information (in other words to be able to receive the information visually). Everyone who can see, sees things in different ways. The human eye and brain is very good at distinguishing shapes, patterns and colours generally, but for a significant number of people (myself included) there can be difficulties distinguishing some shades, or some colours. The term colour blindness is used, but that may be misleading, and colour vision deficiency is better. Around 1 in 12* men and 1 in 200* women have some degree of colour vision deficiency. Complete colour blindness (or monochromatic vision) is extremely rare. See NHS choices Colour vision deficiency page for more information. 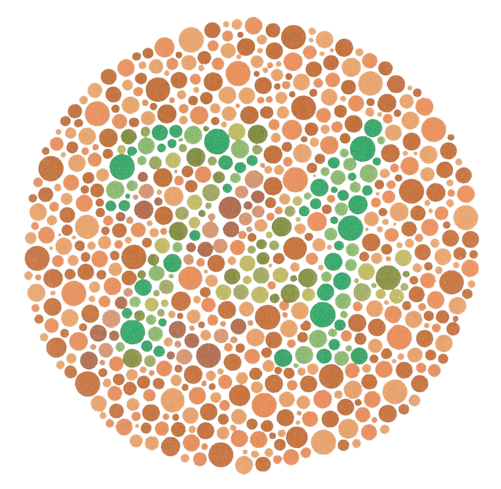 If you can see the number 74 in the main image above, you may have normal colour vision (but this is only one test), and if you can see 21 like me, you may have a red-green colour vision deficiency. for text to be readable or other elements to be distinguishable they need to have sufficient contrast with the background. Reading in bright conditions is much harder because contrast is lower. The Web Content Accessibility Guidelines (WCAG) recommend minimum levels for colour contrast between text and background, based on a mathematical formula. There are tools that can be used to measure this and one that I use regularly is the free Paciello Group colour contrast analyser. 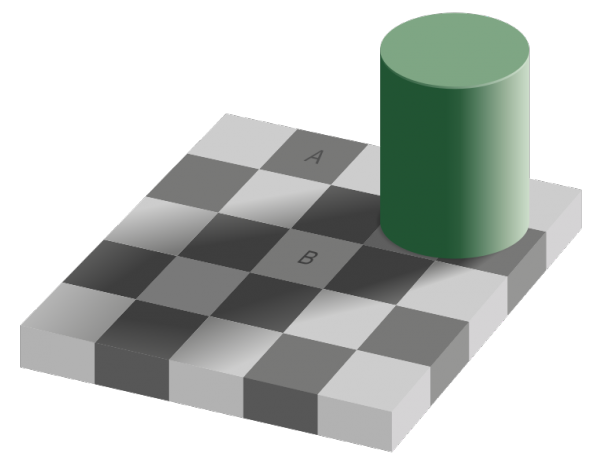 If you look carefully at the squares marked A and B they appear to be clearly different colours, or rather shades of grey, but if you check the colour with the colour contrast tool, you will find that both squares are exactly the same colour. The shadow cast by the cylinder tricks the eye and brain into getting this wrong. Join the conversation on Twitter with Richard at @accessibleweb and GDSteam, and don't forget to sign up for email alerts. The last image is a very good demonstration (#787876 for both)... but could you make the letters the same colour (#505050 for A, #3E3E3E for B)? I work for the VOA and they have updated their intranet but it would appear they have not reviewed the contrasting issues as some of the fields blend into the background for example the search box is difficutl to find. I tried to flag it up. GDS discriminates against a whole swathe of people that can only read things with contrast 6.0:1 or above - see the WCAG 2.0 AAA guidelines. How do you justify this? We set a minimum level of accessibility at WCAG 2.0 AA, in line with industry practice globally (and roughly equivalent to the U.S requirements for section 508), but we do encourage going beyond level AA wherever possible. To meet the colour contrast guideline for level AAA it would need a contrast of at least 7.5:1 for standard sized text which our main body copy exceeds. Is there a universal colour combination/contrast for background colour and text colour that is the most accessible? And if so, what is it and is there a reason why GDS do not use it for main body copy? There isn't a universal combination of colours for text and background that is accessible to everyone. The highest contrast is between pure black and pure white, so that would seem an obvious choice, but for many people with dyslexia that can be too extreme and so make the content less accessible. GDS uses a very dark grey instead of black for that reason. I agree that the minimum contrast level is too low. I struggle to see anything under 7 in many situations.